You are talking to God, the One who created the universe and you. And God loves you. Take all your troubles to Jesus... even the smallest ones. Because He wants to help you. Korah, a woman I know, had visited her family in a distant city. It had not been a happy experience. Some family members were jealous of her prosperity, and hurt her with their cruel remarks. On her flight home, she could not stop crying. With a sad heart, she turned to the Lord in prayer. Her words were, "Lord, if they are not going to change, please change me." Within seconds, Korah experienced a great sense of relief. A quiet peace flooded her heart. Korah continues to take all her troubles to the Lord, and He never fails to answer her prayers. Often they are our own family members, relatives or close friends... but few of us pray for them. Many of these needy people have known Jesus, but are no longer close to Him. They need to return to their Father's House and experience His empowering help and love. Each day say an Our Father, a Hail Mary and a Glory Be for people who need Jesus. Saying Grace before meals blesses those present and teaches your children to pray. 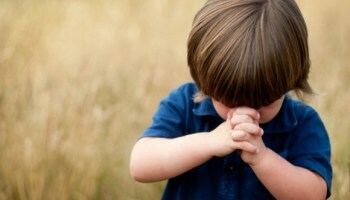 Children love to learn easy to say prayers. 1.) The thumb is the closest finger to you. So start praying for those who are closest to you. They are the persons easiest to remember. 4.) The fourth finger is the ring finger. Even though it may surprise you, it is our weakest finger. It should remind us to pray for the weakest, the sick or those troubled by problems. They need your prayers. 5.) And finally we have our smallest finger. Your pinkie should remind you to pray for yourself. When you are done praying for the other four groups, you will be able to see your own needs in the proper perspective, and also you will be able to pray for your own needs in a better way. Praying the Rosary together brings a special blessing on a family.